La Tomatina is a spanish festival that is held in the Valencian town of Buñol, in which participants throw tomatoes and get involved in this tomato fight purely for fun. It is held on the last Wednesday of August, during the week of festivities of Buñol. The festival is in honor of the town's patron saints, St. Louis Bertrand (San Luis Bertràn) and the Mare de Déu dels Desemparats (Mother of God of the Defenseless), a title of the Virgin Mary. 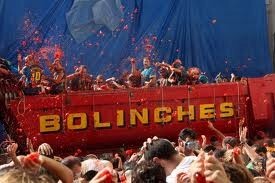 The tomato fight has been a strong tradition in Buñol since 1944 or 1945. No one is completely certain how this event originated. Possible theories on how the Tomatina began include a local food fight among friends, a juvenile class war, a volley of tomatoes from bystanders at a carnival parade, a practical joke on a bad musician, and the chaotic aftermath of an accidental lorry spillage. 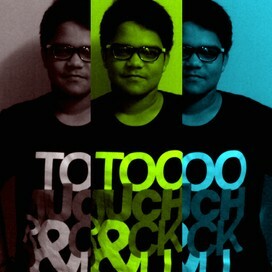 The festival doesn't allow ripping off T-shirts. In a tiny obscure village in karnataka- tamil nadu border called Gummatapura, is celebrated Gorehabba. Unique it may be but surprisingly , is very similar to the much talked about and the world famous La Tomatina Festival of Spain.The Gorehabba involves the splashing of cow dung, collected by villagers followed by a number of rituals till the real fun starts. 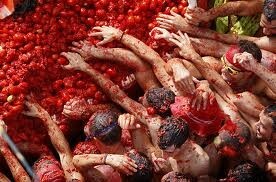 The La Tomatina , is pretty much the same. Rotten tomatoes work for the Spaniards instead. A common fact is that,both tomatoes and cow dungs are great for the skin. Want to know more about La Tomatina?